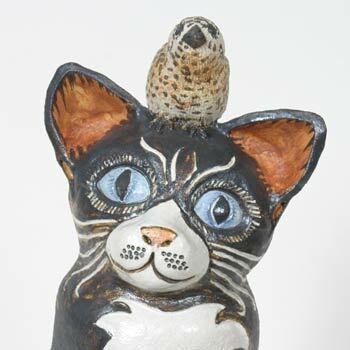 DESCRIPTION Large ceramic cat with a robin perched on the top of the head. The piece is modelled using the coil technique and the details are carved in sculptural grogged Valentine's Earthstone stoneware clay. ARTIST'S STATEMENT A friend of mine was getting married and I knew she was not fond of birds, so I sneakily photographed her cat and created it in clay. As a joke I placed a wren on the cat's head. I have since had numerous request for cats in all shapes and colours. I treat each piece as a blank canvas, and I enjoy working out the different colour ways and patterns. 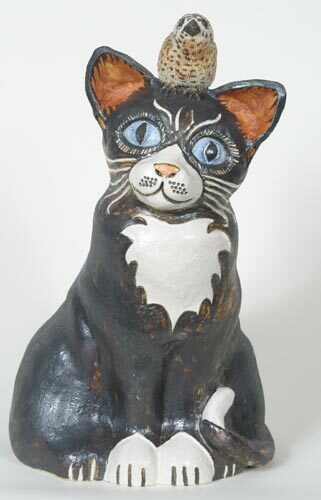 CAT COMMISSIONS For an extra special gift I can create your very own cat in clay and provide it with an avian companion. I will require lots of good quality photographs from all angles and about three months to complete. I can provide you with lots of images of the work in progress.